This review, by poet James Tipton, first appeared in MexConnect online mazazine. This man has a knack for searching out and then writing well about interesting places, people and events. 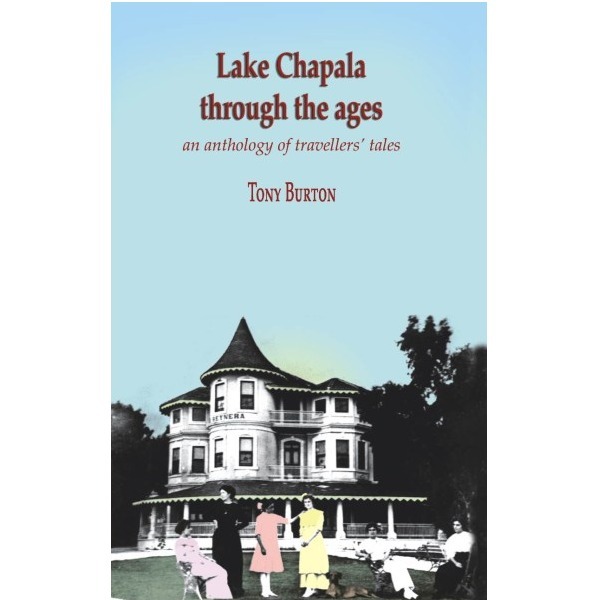 Because I like to read what Tony Burton writes, Lake Chapala through the ages is one of those books I would buy sight unseen. Many readers own his book Western Mexico-A Traveller’s Treasury (now in its third edition in English with a new edition well under way), which has taken us to off-the-beaten-path destinations. A geographer, Burton has also created the definitive street maps of the Lake Chapala area, maps that have been copied by others but which are original with Burton: Lake Chapala Maps – 2008. Obviously Burton is no stranger to our shores here at Lake Chapala. Some of the excerpts are about those early relationships with the Indians: “Converting the barbarians” (mid-16th century),” but others are about geographical details – “Gathering geographic knowledge” (1579-1585) or “Lake Chapala… as large as an ocean?” (1600c). Still others are about a new paradise, filled with abundance, and with fascinating new fruits and vegetables: “Some roots that are called xicamas grow there, shaped like, and almost the same color as, round turnips, without any root hairs, so thick that each one weighs at least thee pounds…. It is a very delicious fresh fruit, marvelous medicine for thirst, especially in hot weather and in hot lands.” (from “Visits to the Lake Chapala friaries” 1585-1586). In earlier censuses taken by the Spaniards (“Early censuses 1768 and 1791-1793”) we discover that Chapala had 123 Spaniards, 451 Indians, 37 mulattos and 671 castes, figures that were particularly interesting to me because the castes (those of more mixed parentage than mestizos or mulattos) now significantly outnumber the Spaniards and Indians combined. Throughout Lake Chapala through the Ages, Burton selects highly varied material that does not bore us with the weight of history and ponderous prose but instead actually delights us and even makes us long for more. Many passages are actually charming, and the historical notes provided by Burton are themselves illuminating and pleasurable. By the early 1900s, tourism comes into sharper focus. One early and popular traveller’s guide, Lake Chapala, a travellers’ handbook (1909) by Thomas Philip Terry lists rooms available in Chapala, e.g. Hotel Arzapalo, “facing the lake,” at $2.50 to $5 American Plan. In his note to this excerpt, Burton tells us that D. H. Lawrence, because of this handbook, was convinced to visit the lake; and of course Lawrence ultimately moved to Chapala in the mid-twenties and this is where he wrote The Plumed Serpent. And so, there is something for everybody in Tony Burton’s, Lake Chapala through the Ages. Whether you are fascinated by the early history of the place where you now live or visit (or would like to visit), or whether you are interested in early accounts of the natural history of the region, or of the lake itself or whether you are fascinated by those votive objects found on the bottom of the lake, or whether you simply want to connect yourself more deeply to the place you now call home (or that is “home” in your imagination), this book is for you. I think Lake Chapala through the Ages is terrific. Buy it!